Note 1: “Default” is the name of the Remote Domain setting where you want to turn off NDR. set-RemoteDomain “Default” -NdrEnabled $true. This places a tick in the checkbox. 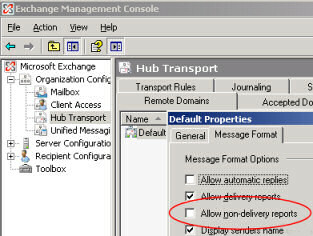 If you clear this option, NDRs aren’t sent to any email address in the remote domain.